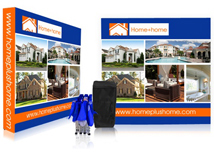 The RPL Ready Pop display is an affordable pop up display that is designed for trade show and marketing events. With a turnaround time of only 2 business days and a low price point this display is the perfect solution for upcoming events. 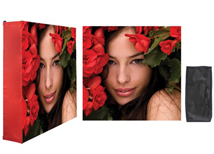 We offer multiple sizes that work as freestanding displays or on table tops. 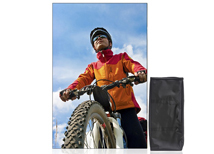 The collapsible frame and full color graphic make this display an amazing value for the price! The RPL(Ready Pop Lite) System uses an accordion style pop up frame with a seamless dye sub fabric graphic to create a full color back wall. 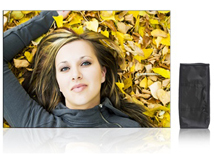 The aluminum framework is design to create a tension system that keeps the graphic looking tight and professional. We offer multiple sizes in the RPL for all types of event including trade shows, event fairs, and expos. Fast turnaround and shipping from either coast really makes the RPL a great solution for events across the country. The RPL’s main benefit is the fast turnaround and low price. For clients looking for a quality, limited use product the RPL fits the bill. Although it is designed for long term use, the quality finishing and low price point also make it ideal for one time, or limited events where budget is an issue. The standard turn time of 2 business days is ideal for last minute events or planners in a time crunch. Apart from the low price point the RPL is extremely easy to set up and uses popular stretch fabric which is the new industry trend. When considering a low cost trade show display the RPL is one of the products that should be on the list!